My mom will be travelling from Europe to Canada (Winnipeg) soon and I've been researching how to streamline the transfers for her, as she doesn't speak English. She will be travelling from Warsaw to Toronto and then Toronto to Winnipeg. The second flight is listed as "LOT-Polish Airlines Operated by Air Canada". As far as I understood, in Toronto it will be mandatory for her to pick up her check-in luggage then recheck it again. I am unsure about the recheck process. On the Pearson airport website it says "Drop off your baggage at the connection drop-off belt". What does this mean exactly? Does she have to go to an Air Canada desk and show her boarding pass for Winnipeg to check her luggage again? Or is there an automated belt where she can drop off the luggage without any check-in? She will need to clear customs, with her bags, in Toronto. Then she will need to drop her luggage off so that it goes to Winnipeg. There are a lot of signs and a lot of uniformed staff to help you through this process. The YYZ airport has a guide to help you through this. If, as I expect, LOT have tagged the bag as Winnipeg via Toronto, she literally just puts it on the belt as you do after clearing preclearance when you're leaving Canada. If it is short-tagged to YYZ, then she would need to get some staff to tag it properly for her. When she checks in for the flight in Warsaw she can confirm with the gate agent "you're checking my bag right to Winnipeg, right?" and ideally the agent will reply "yes, but remember you have to take it through Canadian customs in Toronto yourself." If for some reason the agent replies "no, it is tagged only to Toronto" then she will need to speak to staff on the ground in YYZ who will tag it on to Winnipeg. I live in Calgary, and quite frequently travel to/from Europe on Air Canada (or StarAlliance-affiliated airlines), so have done exactly this transfer-from-international-to-domestic-Air-Canada-in-Toronto operation many times. Your mother's baggage will be tagged in Warszawa through to Winnipeg, however as you correctly understand, she will need to collect it in Toronto and re-deposit it. The purpose of this is essentially so that she will have the baggage physically with her when she passes through Canada Customs, which will happen during her transfer in Toronto (so if there are any questions, if they want to inspect the baggage, etc. then she can do that). In Warszawa, her baggage will be tagged through to Winnipeg (via Toronto), as above. When she lands in Toronto, she will first be directed to clear Canada Immigration (she will naturally have no choice in this matter - at this point all the signs will indicate "Arrivals" / "Baggage Carousels" / "Canada Connections" / "International and US Connections" and will all point to the same place). After passing through immigration, she will come down the escalators to the baggage carousel area (see the area marked "#1" on my attached map) and will have to pick up her luggage from the appropriate carousel for her LOT flight from Warszawa. She will then continue through to Canada Customs (again, all signs will indicate "Customs" and (possibly?) "Connections"), with her baggage. Immediately AFTER passing through customs, she will make an immediate left turn, following signs to "Canada Connections". 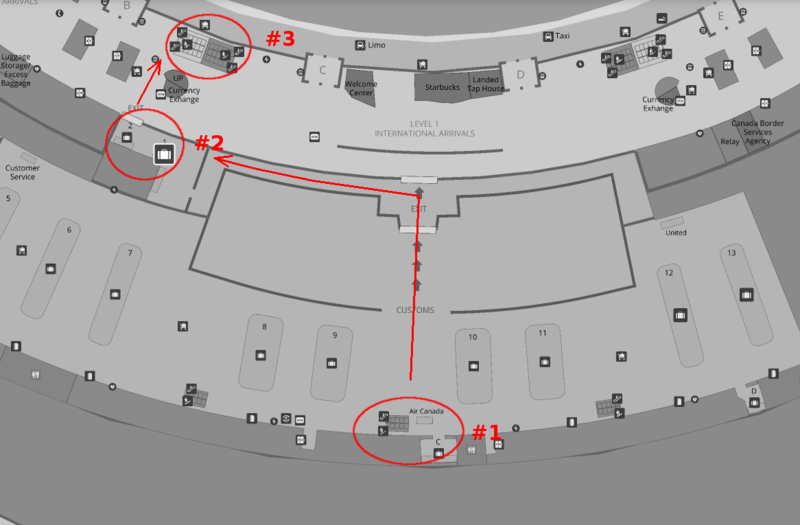 At this point, there is a separate corridor for said connections, with a dedicated baggage drop-off (see the area marked "#2" on my attached map). She will drop off her baggage (still tagged through to Winnipeg) on this conveyor belt (on her left), which should be also checked by local staff to verify it is correctly tagged (although this has sometimes not occurred). She will then exit through the doors on her right (Air Canada staff will usually be on hand at this point to confirm she has a correct onward boarding pass herself) then go up the escalator to the departure level, again following signs for "Canada Connections" (see the area marked "#3"). Once at the departure level, she will pass back through security to the post-clearance domestic departure lounge, where she can proceed to the gate for her onward flight to Winnipeg. Not the answer you're looking for? Browse other questions tagged transit luggage connecting-flights air-canada yyz or ask your own question. Recheck luggage in Toronto when flying from BWI to Heathrow via Toronto on Air Canada?